Yo ......................., originally uploaded by SkeletalMess. 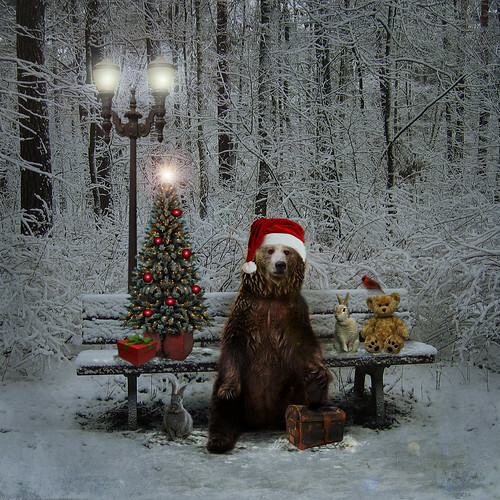 Yo' Beary and his woodland buddies would like to wish you a Merry Christmas. sweet christmas for you too..
A happy Christmas to you! thank you for all your "gifts" throughout the year! Love it! Beautifully done! May this season be merry and bright for you too Jerry. See you in 2011! Oh that is so cute! Love it! Merry Christmas Jerry! All of my favorite critters - bears (stuffed or real), rabbits, and a cardinal!!! I love it. Thank you, sweetie, for the visual hug this morning. I needed it. Merry Christmas to you. I see you and your friends have been busy lately! And hey, cannot wait to visit your new site. Oh! I could NOT love this anymore. How wonderful! And as for your new site, your generosity, as usual, knows no bounds. That's an awful lot of work! Hope you and your family have a wonderful Christmas. Thanks so much for your generosity though out the year. So cute! I love these furry fellas. Merry Christmas and thank you for your generousity with your textures, talent and time. This is so beautifully done, I can't find words to express my feelings about it..........just exquisite! Merry Christmas to you! Love your photos and textures. Beary Christmas to you too! Wishing you and yours peace, love and joy this holiday season and always. Have a great holiday and many thanks for the awesome textures you provide.